Yes, the Pickford twin theaters. 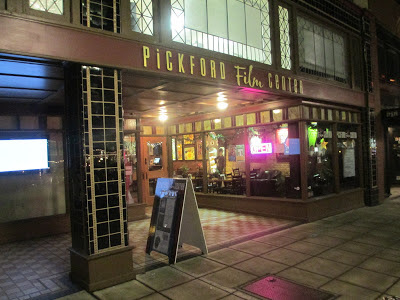 I don't go to movies often so I just got around to seeing a movie at the new Pickford space in downtown Bellingham even though the new space has been open for quite some time now. A non profit and independent theater that's quite successful. It's new space is nice. Stadium seating. I saw Chasing Ice, a documentary about someone's quest to place cameras around several glaciers to record the retreat of ice due to global warming. 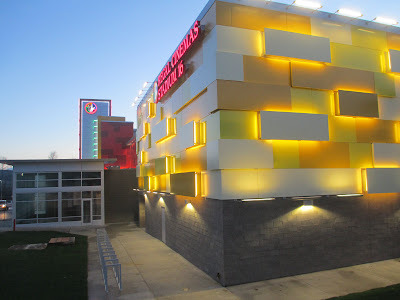 Next day, I biked out Railroad Trail to Barkley Neighborhood to see what the new Regal Barkley Cinemas look like, now that they are finished. 16 screens, stadium seating, even an IMax. Someday, I'll get around to actually seeing a movie out there, but at the rate I take in movies, it will be a while. What looks like a wetland mitigation / runoff retention pond is now celebrated with nice fountains. I got there just as a rare and brilliant sunset was happening. But then along the trail comes this ominous warning sign saying one would be trespassing past here. Trail just continues to parking lot and a bike rack. 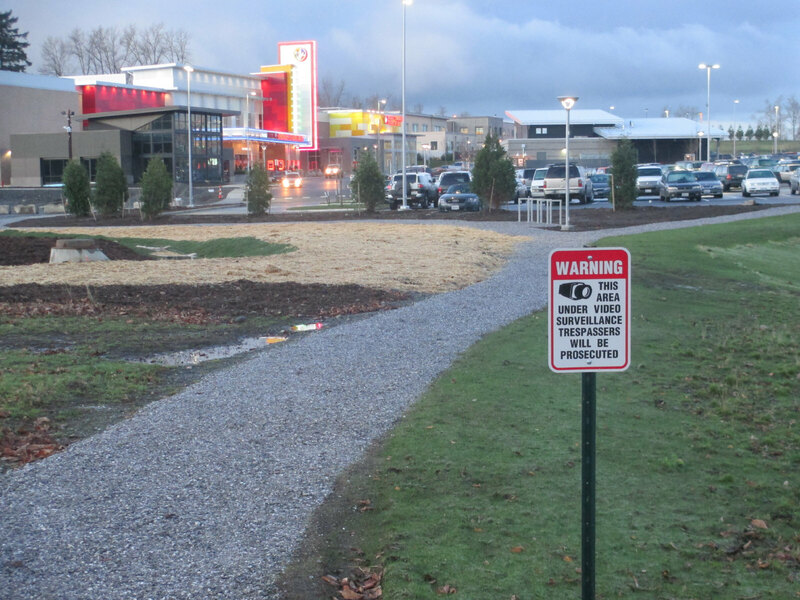 What about connectivity between the theater and the other bike trails around Barkley? What about welcoming access from non motorized corridors? I proceeded anyway and nothing bad happened. No lightning strikes or anything. Theater lighting is impressive. Parking lot almost full, but the bike rack was empty. It was chilly, but not a bad day. At least there is a pretty nice bike rack. 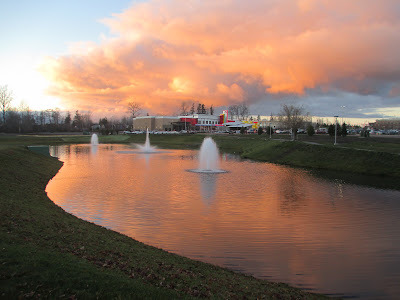 Bellingham Herald reports grand opening a success with first proceeds to local charities. Even in these recessionary times, new theaters have been built in Bellingham. Regal closed 2 of it's old locations in Sunset Mall and Sehome Village to consolidate it's market to the New Barkley Cinemas and its other remaining facility at Bellis Fair Mall. Bellingham still has an economy partially propped up by being close to the Canadian border and spinoff from the success of Vancouver's metropolitan economy. 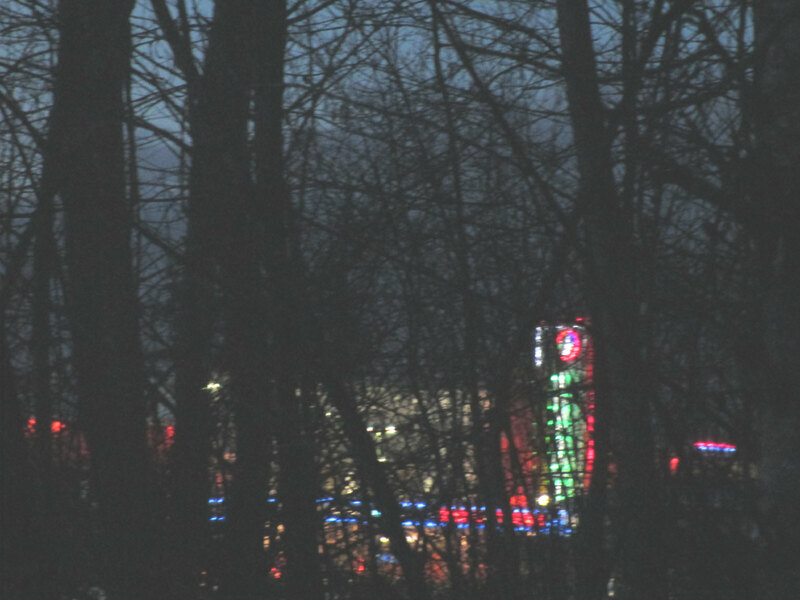 New theaters shimmering through the trees as I head back toward home. Someday I'll go to another movie, but I'm not in a big hurry. It will still be there when I'm ready.